These are best eaten the same day. Alternatively, cool completely, then wrap and freeze for up to a month. Serve with a baby spinach salad. Preheat the oven to 220ºC, gas mark 7. Place the vegetables in a large non-stick roasting tin and sprinkle with the herbs. Add the olive oil, season with pepper then stir until evenly combined. Roast, stirring occasionally, until golden brown - about 25 minutes. Remove from the oven and leave to cool. To assemble the calzone, turn out the dough onto a lightly floured work surface, punch down to deflate, then divide into 4 equal portions. On a floured surface, roll each piece of dough into a ball then use a rolling pin to roll out each piece to a thin circle the size of a dinner plate (about 24cm). Spoon a quarter of the filling onto one half of each dough circle, leaving a 2cm border. 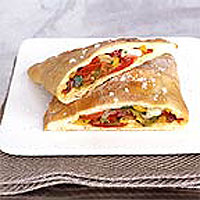 Use kitchen paper to pat dry the mozzarella slices and divide them between the calzone, arranging on top of the vegetables. Brush the edges of the dough with cold water, fold the dough over the filling then pinch the edges firmly to seal. Using 2 palette knives, carefully transfer the calzone to 2 lightly greased baking trays. Cover with clingfilm and leave to rise in a warm spot for about 30 minutes, until almost doubled in size. Uncover. Preheat the oven to 190ºC, gas mark 5. Pierce the top of each calzone with a cocktail stick or thin skewer to allow the steam to escape, then bake for about 25 minutes until a light golden brown. Sprinkle with coarse sea salt to taste. Don't salt the filling as this will draw moisture and make the dough soggy. This is also why it is important to dry the mozzarella on kitchen paper. Place the ingredients into the bread pan in the order listed in the manufacturer's booklet - usually this is the yeast first, then the flour and salt, add 300ml cold water, and finally the oil. Select the cycle to mix, knead and rise the dough, according to the instructions for your particular breadmaker. It typically takes 2-3 hours. When the cycle has finished, remove the dough and use it for the calzone. Cook's Tip: You can also use this dough to make rolls or a small loaf. Refer to the instructions for your breadmaker to bake the dough.